What happens on election day is not going to fix America. If you want to fix America, go back to June 17, 1963 when the United States Supreme Court declared school-sponsored Bible reading in public schools in the United States of America to be unconstitutional. Begin there. Fix that, and then lets talk about it. In 1943, Reinhold Neibuhr wrote (his original version), "God, give us grace to accept with serenity the things that cannot be changed, courage to change the things that should be changed, and the wisdom to distinguish the one from the other." If you want change, the place to start is within yourself. Within myself. This election day, it is not who I am voting for that matters, it is what I am voting against. Vote responsibly. Pray that sanity will prevail afterwards. That is my hope, my prayer. A couple times of year I receive an e-mail telling me that the Federal Communications Commission is going to remove religious programming from the airwaves. This is based on a rumor, which has been circulating since 1975, that the late Madelyn O'Hair, a widely-known self-proclaimed athiest, proposed that the FCC consider limiting or banning religious programming. These rumors are untrue. According to the FCC's Consumer and Governmental Affairs Bureau, in December 1974, Jeremy Lansman and Lorenzo Milam filed a petition (RM-2493) asking the FCC to inquire into the operating practices of radio stations licensed to religious organizations, and not to grant any new licenses for new noncommercial educational broadcast stations until the inquiry had been completed. The FCC denied this petition on August 1, 1975. Ms. O'Hair was not a sponsor of this petition. Since that time, the FCC has received mail and telephone calls claiming that Ms. O'Hair started the petition and that the petition asked for an end to religious programs on radio and television. Such rumors are false. The FCC has responded to numerous inquiries about these rumors and advised the public of their falsehood. There is no federal law that gives the FCC the authority to prohibit radio and television stations from broadcasting religious programs. As christians, we always need to be alert to things that could happen, however, this is one rumor that is totally false. Sonny West is well-known for writing Oh Boy! and Rave On for Buddy Holly and the Crickets. Like all aspiring musicans and singers, Sonny had big dreams. In 1956, he tried to audition for Sam Phillips at Sun Records, but was turned down. As fate would have it, he moved to Lubbock and met Buddy Holly. If Sonny West wasn't destined to make it as a singer, he was bound to make it as a songwriter. Oh Boy! was a worldwide smash hit and is now one of the all-time great rock 'n' roll classics. The song passed the one million airplays mark in 2000, earning Sonny a Citation of Achievement from BMI. Rave On achieved such an immediate response that it was released as a single right away. But, before any money started coming in, Sonny found himself cold, hungry and broke, and down and out from trying to make it as an artist himself. Feeling rejected, he left Texas, vowing he'd never live there again. He moved to Grants, New Mexico, where he began frequenting Mike's 66 Club, located on the outskirts of Grants on Route 66. He became friends with the guitar player in the band. His name was George Hudson. This is his story. George and my dad had been guitar-playing buddies when he lived in my town. They performed together often and were very popular. George and other musicians would come over to dads house, where they would play and sing for several hours. He was small in stature and wore his hair long on top but slicked back with oil, probably Brylcreme. He had long, cigarette-stained fingers that would wrap around the neck of the guitar. A lot of what my dad knew about the guitar, he learned from George Hudson. 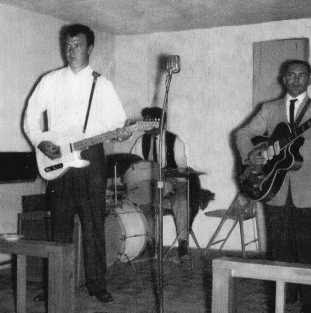 At the club in Grants, George played a Gretsch f-hole electric guitar. (Dad would later purchase a Chet Atkins Gretsch.) Sonny West told me that one night he and George were discussing guitars, and Sonny told him about a new spring reverb, known as a Space Expander, which he had recently bought from a jukebox supply company and installed in his amplifier. He told me that George was so crazy about it, that he installed one in his amp, too. Soon, a vacancy in the band opened up and Sonny was immediately hired. Sonny said George was a fantastic guitar player (which is something I have heard my entire life). He said George was a natural at playing his guitar, and that he could play lead all night long. He said, "I loved George very much. He was one of a kind." One night I was visiting Sonny West's website and saw the above photo. Up to that point, I did not know that George Hudson had performed with him. I e-mailed Sonny and he told me the above story. He said he often wondered what ever became of George Hudson. It was up to me to tell him. It was early 1963 when George left Grants and moved to Beech Grove, Indiana. Several months later my family also moved there, and dad and George got the chance to play music together once again. In February of 1965, I stayed at George Hudson's home while my mom gave birth to my youngest brother, Mark. And then, one night, some three months later, George was performing and had done so well that he was called back to the stage for two encores. The crowd beckoned him for a third one, but he refused, saying his head was hurting. 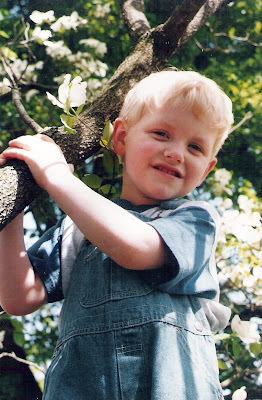 When the pain would not go away, George was taken to a hospital, where doctors found a brain tumor. He died a short time later. My parents attended his funeral, and it wasn't long before we moved back to Kentucky. Note: While living at Beech Grove, Dad also worked at WGEE-AM, where he was voted DJ of the Year for Small Markets. WGEE is the same radio station where David Letterman worked ten years later, but by then it was known as WNTS. Also, while performing in Indianapolis one night, dad met Jack Barlow, who went on to record three songs co-written by dad, Barlow and others, including I Love Country Music (And I'd Rather Fight Than Switch), which helped launched Barlow's career in country music, and went as high as number 18 on Cash Box. WANY-AM went on the air for the first time 50 years ago this Saturday, October, 25th. This is the story of how it all began. The year was 1947. Nine-year-old Darrell Speck told his mother, Dimple, that he wanted to learn how to play the guitar just like her. So, she began teaching him the chords. Soon, he was singing and playing anywhere and everywhere he could. Darrell had a best friend. His name was Sid Scott. Like most young boys, they could be a little rambunctious at times. School teacher Martha Brummett said it was more than a little. Of the hundreds of students that sat in her classroom, she said Darrell and Sid were the meanest. Once, they were kicked off the team bus on the way to a baseball game at Tompkinsville. Apparently, they had become so unruly that the coach had the driver pull over, and Darrell and Sid were left standing on the side of the road. Luckily, someone they knew came along and gave them a ride to the game. They managed to beat the bus to Tompkinsville, which infuriated the coach even more. He refused to let them play. But, soon the Bulldogs were down and in desperate need of a rally. The coach had no choice but to summon Sid from the stands. He came straight out of the stands and walked directly to home plate, where he promptly hit a homerun. Darrell and Sid did everything together and entertaining, one way or another, was the number one thing for them to do. They LOVED to entertain. Darrell would take his guitar to school, and he and Sid would sing and play in front of the students and faculty every chance they got. By the age of 16, Darrell had gotten a job performing on WAIN-AM in Columbia. He and his band, Darrell Speck and the Rebel Rousers, would drive to Columbia every Saturday morning to do a 15 minute radio show. A record would later be made that would eventually put Darrell into the Rockabilly Hall of Fame. In 1955, Darrell left WAIN and began a show on a new radio station that had signed on the air in Monticello. The first time he went to WFLW, Darrell met the station's general manager. His name was Welby Hoover. Darrell auditioned for Welby right on the spot. Welby liked what he heard and agreed to let Speck have a weekly show on WFLW. Darrell did not attend high school past 1955. In 1956, he joined the Navy and married his high school sweetheart, Glenda. He would later get his GED. Sid graduated from Clinton County High School in 1956. Just as Darrell was leaving WFLW to go to the Navy, Sid was being hired there as a disc jockey. He went to work for Hoover in June of 1956. His show was called "The Albany Hour." It aired from 1:00 to 2:30 p.m. Monday through Friday and originated from Dr. William C. Mann's chiropractic office in Albany, which is the building next door to Burger King today. Sid was popular, and good, at everything he did. He graduated from CCHS as one of the all-time great basketball players. Along with being a popular disc jockey, Sid also sold tickets and was in charge of security at Clinton Theatre. But, it was through his radio job that Sid learned that the Federal Communications Commission had made an AM frequency available for Albany. He told theatre owners Cecil Speck and Wallace Allred and plans for a radio station in Albany began to be made. The application authorizing construction of a new standard broadcast station in Albany was granted on May 7, 1958. The following month, Sid left WFLW. Darrell had returned from the Navy, and soon Hoover would leave WFLW to become WANY's first general manager. 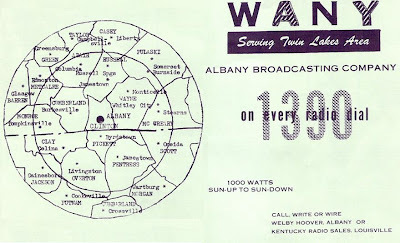 WANY-AM officially went on the air on Saturday, October 25, 1958. I am glad I got to talk to Bro. Bill, and shake his hand one final time Wednesday night at Church. "You are looking good!" I said. He laughed and said, "Well, I wish I felt as good as I looked!" And, then he said, "But, God is good!" Bro. Bill died while eating his breakfast this morning. He was 95. If we could all just be like Bro. Bill, the world would be a better place. There was no finer example of how to be a Christian, and live a Christian life, than him. I have been trying to think of a way to best describe Bro. Bill, and I think the best way to do that is to just simply say, "Bill Johnston Loved the Lord." A memorial service for my great-great-great-grandfather, Pleasant Hillary Ledbetter, a Corporal with Co. F, 16th TN Infantry CSA, during the civil war, was held Saturday, October 4th at the Ledbetter Family Cemetary at Collins Cove in Overton County, as the Myers-Zollicoffer Camp #1990, members of the Highland Brigade, and the Capt. Sally Tompkins Chapter #2123 United Daughters of the Confederacy unveiled a new marker at Cpl. 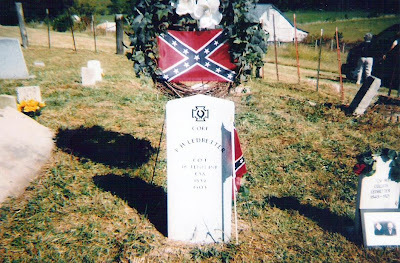 Ledbetter's grave. There was something about being there that day. Something that I cannot really explain. As I stood beside that old family cemetery, a soft breeze blew gently across my face, and my attention was quickly drawn away from the ceremony. Suddenly, I was in complete awe of where I was at...Collins Cove. To say I was completely engrossed in it would be an understatement. It was more than that. It totally had me. As my eyes traced along the landscape and I took in the panoramic view that was before me...the mountain in the background and the creek below it, it was like I could feel the presence of my ancestors who are buried there...like they were looking down on us, smiling. The feeling was so overwhelming. I was standing on Pleasant Hillary's land, but I was so drawn to it, like I belonged there. I do not know why I waited so long to go to Collins Cove, but I know it will not be my last trip. Pleasant Hillary Ledbetter was 24-years-old when he joined the Confederacy in 1861. He was one of 952 men at Camp Trousdale, who were armed with flintlock muskets. It was not a good experience for him. On the Soldiers Application for Pension, he filed on November 20, 1899, Pleasant Hillary wrote, "I took cold on measles, which I had at Camp Trousdale, which affects my throat and lungs badly. Freezing of my right foot to the bone during the march to Huttonsville, Virginia in the winter of 1861 totally disabled [me] for a month or more, and bothered me thereafter at times. [I was also] badly ruptured by said cough [from] straining." He said, "My throat and lung trouble rendered me during the remainder of my service in the army. For the last 25 years, I have been unable to do but little physical labor. The disabilities are permanent." Cpl. Ledbetter was captured while on pickett duty near Loudon, Tennessee. He was given a choice of either going to prison, or taking the oath of allegience to the United States government. Being in bad state of health, he chose to take the oath. Nothing is ended until it is forgotten. That which is held in memory still endures and is real. We are grateful for the records of the past which bring inspiration and courage. We are appreciative of the lessons taught by memorials to events and deeds of long ago. We pray that our lives may always be patterned to give such devotion and service, as did our forefathers. We, the members of Capt. Sally Tompkins #2123 United Daughters of the Confederacy, now dedicate this marker in grateful recognition of Corporal Pleasant Hillary Ledbetter of Co. F., 16th TN Infantry, CSA, a Confederate hero. May it remind all who pause, not only of the noble deeds of this Confederate hero, but of the continuing need for unselfish service. From this moment of dedication, we trust there may come inspiration for broader vision and finer service. Two weeks ago, the Kentucky Broadcasters Association announced its selection committee had chosen long-time broadcaster Sid Scott of WANY as the winner of the Kentucky Mike Award. The award is presented to those individuals who have made outstanding personal contributions to the broadcasting profession in Kentucky. Sid began his broadcasting career in 1956, as a disc jockey at WFLW in Monticello, where he was the host of the "Albany Hour." Two years later, WANY went on the air in Albany, and it was there that Sid honed out a broadcasting career that has spanned six decades. During his broadcast career, Sid has been a disc jockey, chief engineer, sales manager, general manager and sports announcer, doing play-by-play in six different decades. The Kentucky Mike Award presentation comes at a perfect time, as WANY is about to celebrate its 50th anniversary. Sid Scott is a huge reason for any success WANY has seen. The very popular broadcaster is without a doubt, one of THE most popular broadcasters ever in this area. Along with his prestigious broadcasting career, Sid served as Albany Mayor is well-known throughout the region for his 1973 recording of What'll I Do If My 'Baccer Don't Sell during the days of the Singing DJ's. Tonight, I will have the great honor of presenting the award to Sid at the Galt House in Louisville. It is a huge honor for Sid, and I am very proud of him. Past winners of the Kentucky Mike Award include Walter "Dee" Huddleston, A. B. "Happy" Chandler, Bert Combs, J. T. Whitlock, Jack Farmer, Ralph Gabbard, Ralph Hacker, Cawood Ledford, Milton Metz, Van Vance and many others. I have a lot to be thankful for. 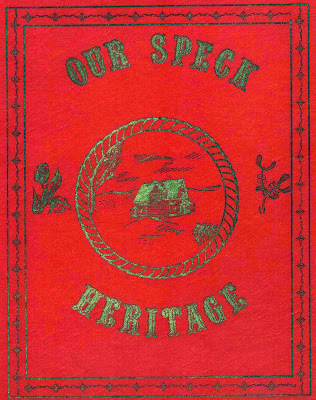 Ever since I wrote The Darkest Hour Before The Dawn (The Story of Jacob Speck), I have been thinking a lot about my ancestor, Jacob Speck, my 6th great-grandfather; his life, and how it ended. How his family must have struggled to get to America! Things had turned to the good for Jacob here in the land of opportunity. He had a beautiful young family, and no doubt so many hopes and dreams. No doubt, he was thankful for how God was blessing him here in America. What joy he must have had in his heart! He was a brave man, not afraid to stand up for the country that was allowing him to enjoy something we all too often take for granted - freedom. What must have been on his mind as he stood in line waiting for the battle to start that morning at Camden, South Carolina. He did not have the chance to run as the others did. Knowing how the Gates' battle plan was poorly designed, I would have wanted him to, for only to spare his life. During the civil war, just before he was executed by hanging, Champ Ferguson's wife instructed him to 'die like a man.' Champ replied, "I wish there had never been a war." Life is so precious. How often do we overlook that part? George Speck never knew his father. I wonder how many times he said, "I wish there had never been a war!" Probably a lot. Jacob Speck's story is a sad one, but it reminds me that God never closes one door but that He doesn't open another one. Before his death, God allowed Jacob to plant the seed that eventually brought me into this world. Then, He blessed Jacob by allowing him to see his new son George, my descendant. Surely, before he left home to do battle, Jacob must have looked at his newborn son and thought about George's future...a future that includes me. God is good and I really do have a lot to be thankful for. 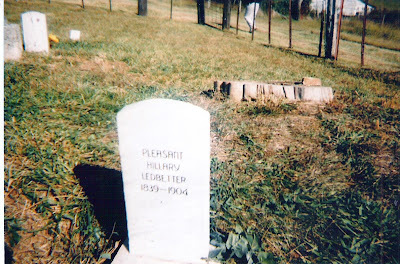 On Saturday, October 4th, 2008 at 2:00 p.m., the Sons of Confederate Soldiers will conduct a memorial service at the gravesite of my great-great-great-grandfather, Pleasant Hillary Ledbetter, who fought in the civil war. The SOCS recently erected a brand new marker at Pleasant's grave, which is located at the Ledbetter Family Cemetary at Collins Cove in Overton County, Tennessee. The SOCS will conduct a memorial service in their civil war uniforms. I am greatly looking foward to attending this event, and my sons, J.D. and Elijah, will be there so they may learn more about their great-great-great-great-grandfather. Pleasant Hillary is the grandfather of Josie Ledbetter Speck. Josie was the mother of my grandfather, Cecil Speck. Pleasant's wife was Icy Ann Collins. Icy Ann Collins's great-great-grandfather was John Plumlee. 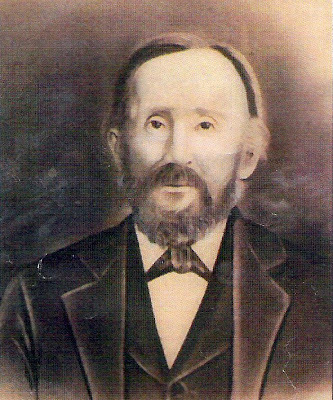 He was the father-in-law of Phobe Denton, who was the aunt of Isaac Denton, the first pastor of Clear Fork Baptist Church. My aunt, Marsha, sent me a great e-mail the other day of a small boy, who did not have any money to put into the offering plate, so instead, he put the plate down on the floor, stood inside it and proclaimed, "Jesus, I don't have anything to give you today, but just me. I give you me!" That story reminded me of a incident that happened almost 10 years ago at Beech Bottom Baptist Church. It never failed that when we would walk into that Church, people would start grabbing for all three of my kids. Always, at some point during the service, J.D., or Marina, would walk from one pew to another, usually enticed by a piece of candy or a stick of gum or some toy. Not that I agreed with all that, but I was very outnumbered. I was raised to keep my back to the pew and my face turned toward the preacher, and if I didn't, boy did I get in trouble! Elijah was an infant so he was unable to walk around. Praise the Lord for that much! 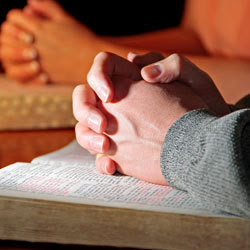 One Sunday morning, as we walked into the Church building, someone reached for J.D. and just like that he was gone. Just before the Preacher began his sermon, I looked around from my seat up front and spotted J.D. sitting in someone's lap with a sucker in his mouth. I thought that would keep him quiet -- and still! Boy was I wrong. Right in the middle of the sermon, I caught movement out of the corner of my eye and looked around just in time to see J.D. walking right up the middle of the aisle with one of his arms outstretched ------------- headed right for the preacher. I reached my arm out as far as it would go, but he was too far away for me to grab while sitting down. Just as I started to stand up and get him, the preacher said, "He's okay, let him alone." I thought better than to do that, but I sat down anyway. And, J.D. continued heading toward the puplit with his arm outstretched. I was on the verge of crawling under the pew when all of a sudden, J.D. went PAST the preacher. I thought, "Huh?" It was then that I realized he was headed for the offering plates! At Beech Bottom, the ushers would take up the offering, and immediately return the plates to the table behind the pulpit with the money still in the plate. To myself I said, "Oh no, he's going to get some money out of the offering plate!" How embarrassing this was going to be. How mad I must have been. I'm sure my face was beet red. Just as I once again started to crawl under the pew, J.D. reached the offering plates. I thought, "Here goes!" But, instead of reaching for the money in the plates, he simply droped the sucker's wrapper in the offering plate, turned around with no emotion showing, and headed right back to the lap he had been sitting on. Everyone laughed, mostly at me, but I was relieved that at least he hadn't taken any money out of the plate. At the time, I tried to think of a way that I could apply reason to what J.D. did. I began asking myself, "How can the Lord use that candy wrapper?" I came up with this: In J.D. 's heart, he was giving. To him it wasn't about m-o-n-e-y. He was giving what he had. And, even though it was a candy wrapper, it reminded me that God wants me. J.D. only knew to give, and he was giving from his heart. I Give You Me...if only I could learn to do more of that.